Rick and Jennifer, a boyfriend/girlfriend team of parapsychology majors set out to investigate West Mansion, a rumored hotbed of paranormal activity. Urban legends purport that Dr. West involved himself with gruesome, occultist activities. Rushing into the house due to an impending storm, Rick is rendered unconscious only to awaken hours later, transformed by a cursed mask into a powerful, but grotesque hulk. 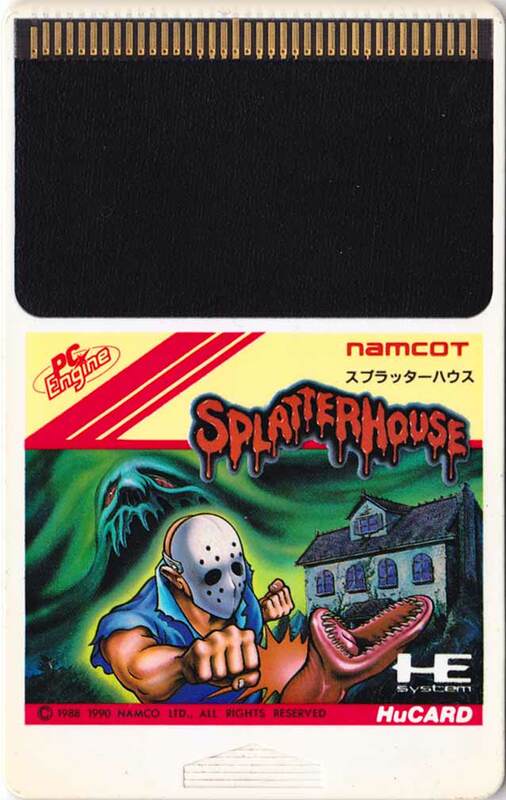 Jennifer is missing, and his newfound strength gives him the wherewithal to search for her in the Splatterhouse. Though his gait is lumbering, Rick can punch, kick, low punch, low kick, and jump punch/kick in rapid succession. Kicking when landing from a jump performs a powerful slide kick. Cleavers, rocks, wrenches, 2x4’s, spears and shotguns can be found to give Rick aid in rendering the hordes of evil into stew while he traverses the seven sometimes branching stages of Hell. 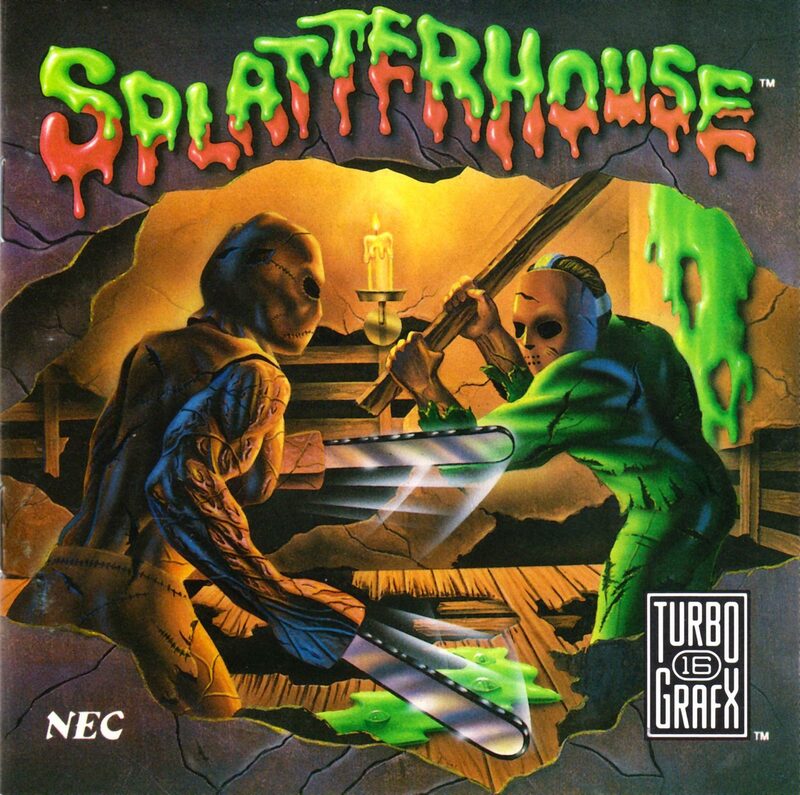 Large, hand painted characters, gruesome creatures that turn to slush when you kill them, reanimated corpses vomiting and stereo chipmusic with eerie instrumentation. I knew my $30 dollars of hard-earned summer job money hadn’t gone to waste. 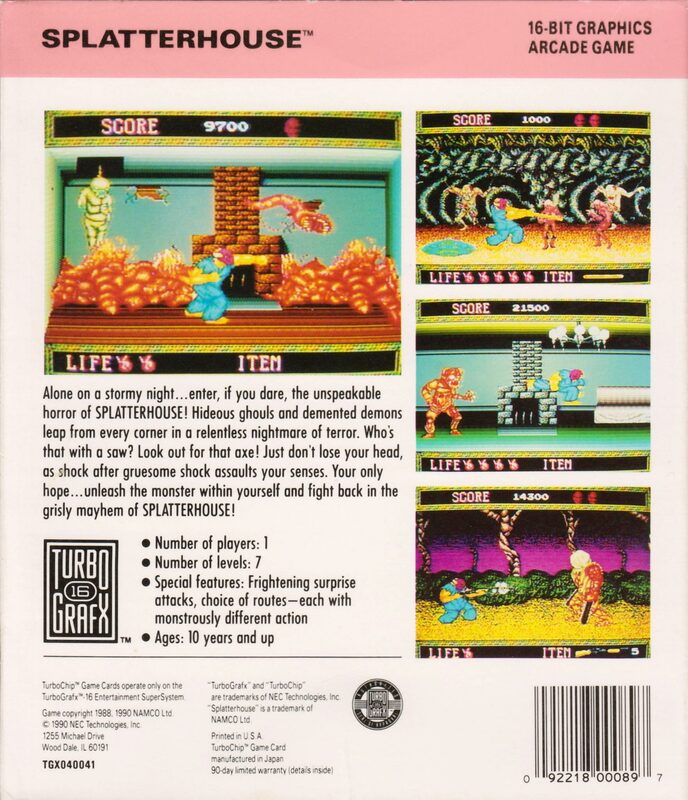 (I didn’t know of the arcade version back then). (Spoiler Alert) At first, the story sounded so simple, and the beginning scene of the mansion was on par with an NES title. But, when the game started and all Hell literally broke loose, I was hooked. Each level provided new demons and strange, surreal settings that didn’t overshadow the main interactions with too much detail. I cringed the first time I saw the bag of flesh crawling towards me on the ground, and actually jumped when Rick’s doppelganger broke through the mirror. Though the game is not too difficult, it took many tries to learn the proper attacks to advance without dying. I knew there was to be more story development when Rick entered an empty chapel with an uplifting tune playing, only to be left alone and empty handed. This game was playing with my emotions. Finally I reached the room where demons were performing a ritual around Jennifer and real digital voice (a rarity back then) had her helpless little voice screaming “Help Rick!” before she mutated into a demon. I thought “YOU BASTARDS! WHAT HAVE YOU DONE! ?” This all culminated in saving her soul, but holding her lifeless body as it dissolved in my arms…what…I mean Rick’s arms! Then to find that the house itself is ALIVE and you have to go through its womb fighting screaming little Satan babies - what a ride. Therein lies the magic of this game. It got to me in a way that games usually don't. The build up and scripting of losing Jennifer got to me, though simplistic and through a video game. It was just like a favorite character dying in a book or a movie. I can think of two other times I went "NOOOOooooooo....!!" in a game, Nei in Phantasy Star II, and Aeris in FFVII. Play this game! 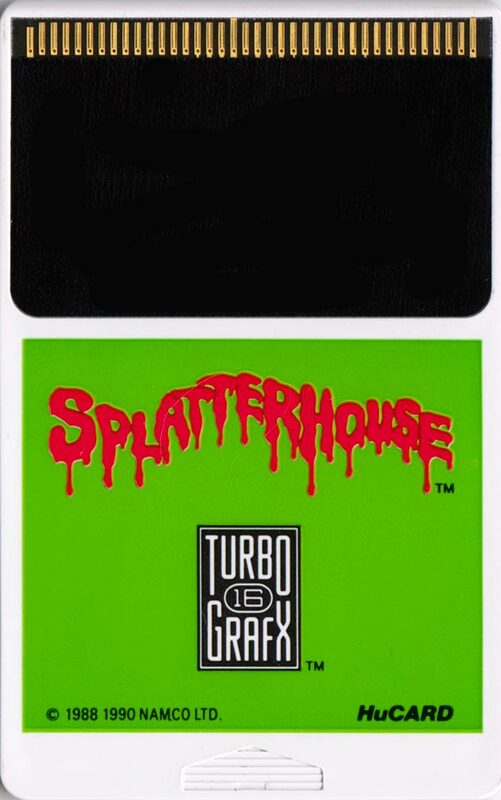 Turbografx/PC Engine owners owe it to themselves to play great games. Most of the music does well to create atmosphere but a couple the songs are pure magic, especially the end stage and the saddeningly sweet minor lullaby that plays in the end. In this era of emulators, I found and played the arcade version and am convinced the same character graphics were compressed and used, they look the same even though the backgrounds are very simplified and censored. 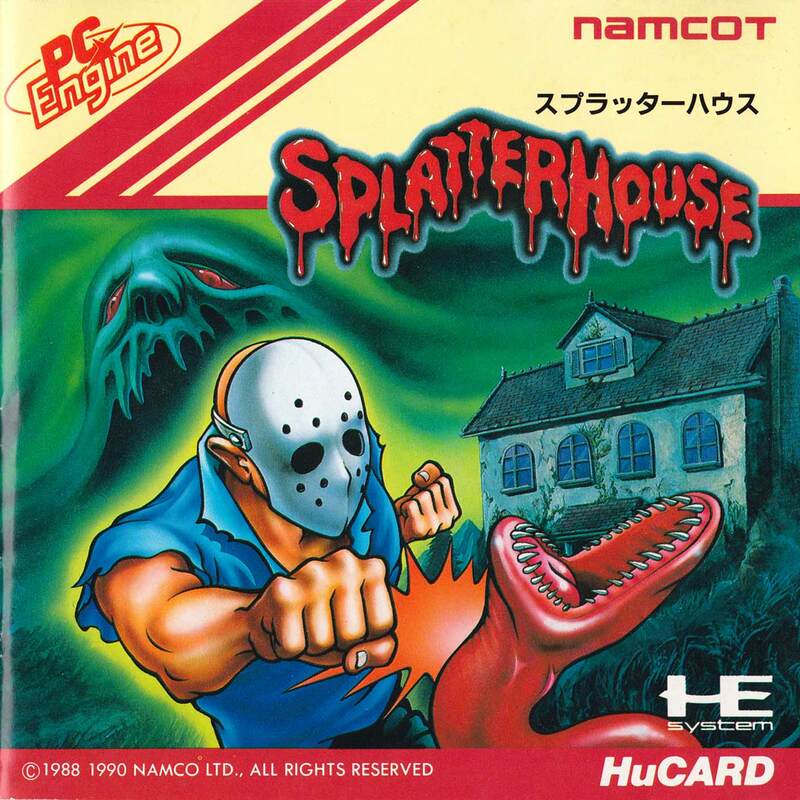 Splatterhouse is a pretty simple game, but its theme and big chunky sprites instantly set it aside from other brawlers of the time. 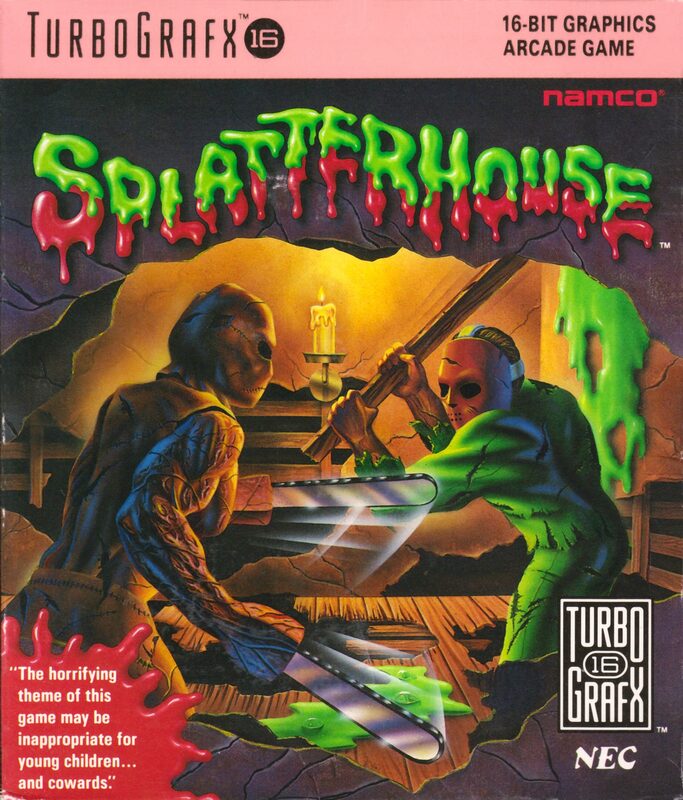 Surely this game was responsible for some of the controversies around video game violence back in the day? The graphics aren't incredible, or at least they look a little bit dated, but that's looking back with hindsight. The game does a lot right, giving you weapons (including a branching path on the first level that rewards good timing) like shotguns and 2x4s, and making you feel suitably powerful as you smash enemies into the background. There are also a few surprises, along with a good story, and plenty of variation throughout the levels. LEVEL SELECT - When the prologue starts up and there's a house in the rain, press Select 3 times, followed by pressing and holding down-left on the directional pad and then press button I or II. It'll bring up the option to select a level. SOUND TEST - First enter the code to access the stage select option. When in stage select, press and hold the select button. After a second or two, the stage select option will become a sound test menu.